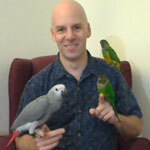 Parrot Forum • View topic - does your bird sing with you?? does your bird sing with you?? Re: does your bird sing with you?? Squeaky sings with me and he sings without me. He earned his name. Malachite makes funny sounds at/with me but he doesn't really sing yet. Myrtle, my 1 year old BF Amazon, sings La La La or Ba Ba Ba. Her all time favorite is the parrot singing opera on YouTube. At 6 pm, and she knows the time, she wants the opera singer put on. Watching some of the other videos, Myrtle is not the only one. Many have copied it. I just wish I new how to collect multiple copies and play them so I wouldn't have to run back and push replay. She lets me know when it goes off. 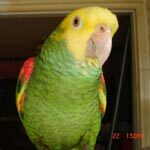 liz wrote: Myrtle, my 1 year old BF Amazon, sings La La La or Ba Ba Ba. Her all time favorite is the parrot singing opera on YouTube. At 6 pm, and she knows the time, she wants the opera singer put on. Rambo sings childrens songs but only when he is in the mood. With Old McDonald he gets stuck on quack quack. Dante will sing along with me. I've been teaching him parts of "The Java Jive" (by The Manhattan Transfer) and very often when I start singing, "I love coffee, I love tea," he joins in with me to sing, "I love the java jive and it loves me". Nikko also sings along with both me and Dante, although he doesn't know the words. He just makes loud peeping kind of sounds whenever either of us sings. Jetty whistles Zelda:Ocarina of Time songs with me, call-and-response style. I whistle one phrase, he whistles the next, I whistle the next, and on we go. Sometimes, if I am lucky, he'll initiate the game. We often play that game when I am out of the room he's in - he contact calls a couple of times and then one or the other of us will start whistling tunes.